Connor Goldson insists the furore following Rangers’ Old Firm melee with Celtic has been over-blown. Both clubs have been charged for failing to control their players after an angry head-to-head at the end of of last month’s derby battle. Gers midfielder Andy Halliday confronted Hoops skipper Scott Brown after he appeared to aim a series of gestures at the away support as the champions-elect lapped up their 2-1 triumph at Celtic Park. Members of both squads rushed in to haul the pair apart but not before some angry pushing and shoving. 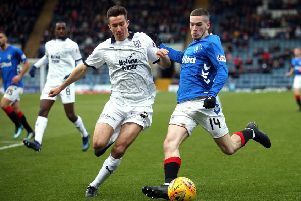 Halliday was shown a second yellow card after the final whistle while Brown has since been cited by Scottish Football Association chiefs for “not acting in the best interests of Association Football”. The melee was also condemned by Scottish Police Federation vice-chairman David Hamilton, who branded the behaviour of both teams after the Parkhead showdown “unacceptable”. However, Gers defender Goldson believes the reaction to the fracas has been over the top. “It’s football. The type of game that it is with the atmosphere meant that it probably boiled over more than it should have. “But at the same time I don’t think there was really much harm done. “It wasn’t like a big fight. It was maybe just a bit of pushing between 20 players.